Northern Virginia Religious leaders marched this morning to JP Morgan’s DC offices after the Bank refused to invest adequately in Prince William County, VA. The county was hard hit in the mortgage crisis, and the investment is needed to re-build the blighted communities. Fr. Seamus Finn, OMI and the Oblates, as investors in the major banks, have been supportive of the community effort to deal with the mortgage crisis, through VOICE (Virginians Organized for Interfaith Community Engagement). Fr. Finn spoke at the rally, calling on the JP Morgan Chase to make a meaningful investment in the community. Watch a video of the speech on YouTube. VOICE leaders plan to meet with Federal Regulators in the next month to ask them to sanction the bank for predatory lending practices, and to investigate credit card robo-signings in Northern Virginia. During the housing and foreclosure crisis, Prince William County, Manassas and Manassas Park had the highest number of foreclosures in Virginia – more than 20,000, with more than 30% of families currently underwater on their mortgages. For the last two years, VOICE – a coalition of more than 50 religious congregations and civic organizations – has sought to hold three financial institutions accountable for their roles in this crisis – Bank of America, General Electric and JP Morgan Chase. On June 3, 2013, Senator Mark Warner (D-VA, Senate Banking Committee) announced a $30 million pilot program to restore neighborhoods devastated by the foreclosure crisis, as well as to build and preserve rental housing that is affordable for families in Prince William County, Manassas and Manassas Park. The plan includes commitments from Bank of America, ($10 million for acquisition financing), General Electric ($5 million for rehab and equity-like capital) and the Virginia Housing and Development Authority ($15 million for long-term financing). 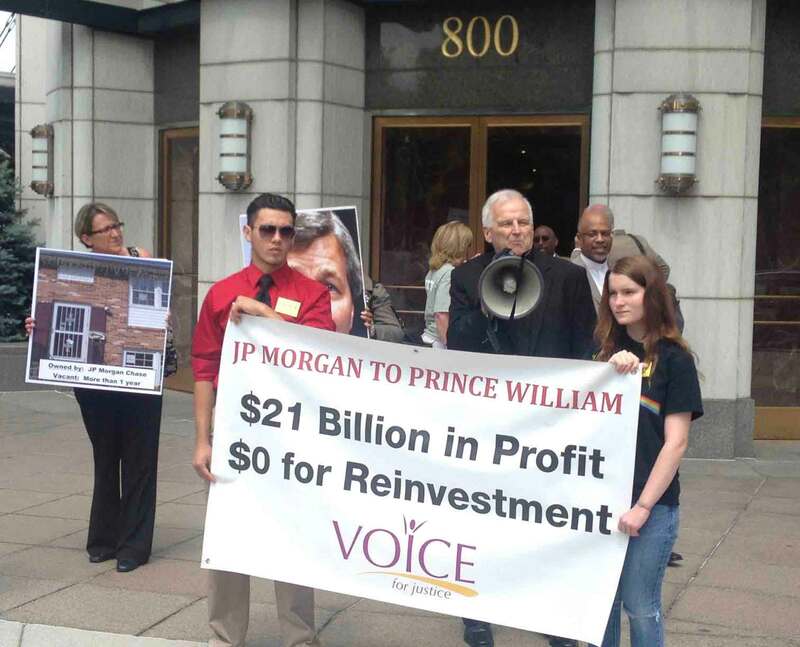 VOICE is calling for JP Morgan Chase to reinvest $10 million at 1% for 20 years. GE has committed $5 million on these terms. Without JP Morgan’s commitment, the the project will not happen. VOICE is affiliated with the Industrial Areas Foundation (IAF), the largest and oldest citizens’ organizing network in the US.